The Tehuacan-Cuicatlan Valley in southern Puebla in the wet season. The Frangipani plant in the genus Plumeria of the Oleander Family (Apocynaceae) is often associated with Hawaiian floral necklaces. However, Plumeria is native to Mexican and Central America dry forests. 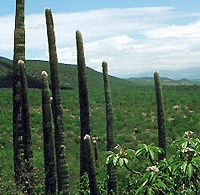 A Plumeria plant can be seen in this photo from northern Oaxaca just to the right of center in front of the stems of the cactus Cephalocereus columna-trajani.